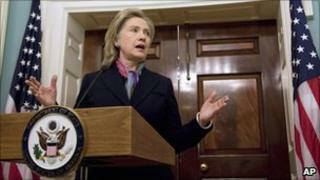 Has release of Wikileaks documents cost lives? Image caption Hillary Clinton called Wikileaks' latest release "an attack on the international community"
The latest release of Wikileaks documents - a trove of US diplomatic cables which offer, among other things, unflattering and candid assessments of world leaders - has deeply angered American officials. Secretary of State Hillary Clinton said Wikileaks' actions undermined US foreign policy efforts and amounted to "an attack on the international community, the alliances and partnerships, the conventions and negotiations that safeguard global security and advance economic prosperity". New York Congressman Pete King has called for the US Attorney General to designate Wikileaks a terrorist organisation and to prosecute founder Julian Assange for espionage. Much of the criticism of Wikileaks, though, revolves around the notion that releasing such information risks lives. Identities of informants could be compromised, spies exposed, and the safety of human rights activists, journalists and dissidents jeopardised when information of their activities is made public, the argument goes. US military officials contend that allowing enemies access to their strategic and operational documents creates a dangerous environment for American troops serving abroad. On Saturday, US state department legal adviser Harold Koh wrote in a letter to Wikileaks that the most recent document dump "could place at risk the lives of countless innocent individuals" as well as "ongoing military operations". He accused Wikileaks of endangerment "without regard to the security and the sanctity of the lives your actions endanger". But is there any real evidence of this peril? The problem for officials like Mr Koh is proving direct links between the information released and any loss of life. After the release of an enormous haul of US defence department documents in August, Pentagon spokesman Geoff Morrell told the Washington Post: "We have yet to see any harm come to anyone in Afghanistan that we can directly tie to exposure in the Wikileaks documents." But, he added: "There is in all likelihood a lag between exposure of these documents and jeopardy in the field." After this latest release a Pentagon official, who wished to remain anonymous due to the sensitive nature of the material involved, told the McClatchy newspaper group that even three months later the US military still had no evidence that people had died or been harmed because of information gleaned from Wikileaks documents. Daniel Ellsberg, the former military analyst who in 1971 released the Pentagon Papers which detailed government lies and cover-ups in the Vietnam War, is sceptical of whether the government really believes that lives are at stake. He told the BBC's World Today programme that US officials made that same argument every time there was a potentially embarrassing leak. "The best justification they can find for secrecy is that lives are at stake. Actually, lives are at stake as a result of the silences and lies which a lot of these leaks reveal," he said. "The same charges were made against the Pentagon Papers and turned out to be quite invalid." Mr Ellsberg noted that with this release, the newspapers involved co-operated with the US government to ensure that the information they published did not imperil lives. New York Times executive editor Bill Keller told the BBC that although his newspaper did not always agree with the advice of US authorities, it had carefully redacted the published documents to remove identifying information. "Our hope is that we've done everything in our power to minimise actual damage," he said. Carne Ross, a former UK diplomat at the United Nations, told the BBC that the effects of Wikileaks were largely unknowable at this point. "I don't think it has been proven that this is dangerous to US troops, for instance. I haven't seen that case made very clearly," he said. "What I think this means is that we need to look at our own mechanisms for democratic accountability and foreign policy. We need to be much, much better." One thing the experts appear to agree on is that the leaks will make it more difficult for US diplomats and human intelligence operatives to do their jobs. Although that does not present an immediate threat to American lives, strained international relations may create a more dangerous world. "They embarrass governments with which the US co-operates," Max Boot, a senior fellow at the Council on Foreign Relations, said of the leaks on the BBC's World Today programme. "At the very least, they will make governments like Pakistan and Yemen and others, which are collaborating with the US in the battle against terrorism, more reluctant to co-operate. "It's harming some of the vital activities that the US government, the UK government or others engage in, which are protecting us against terrorism."